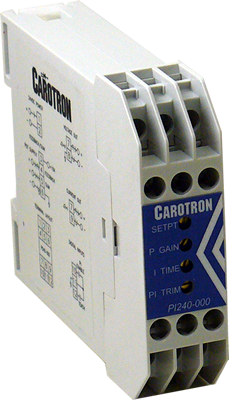 PI Loop Model PI240-000 is designed for industrial applications that require a basic Proportional-Integral (PI) loop controller. Some example applications include Dancer Positioning and Loadcell Tension Control. The PI Loop module includes onboard multi-turn potentiometers for adjusting the Setpoint (SP), Proportional Gain, Integral Time, and PI Trim. The module provides terminals for connecting the process variable (PV or feedback) signal and an optional summing input signal. Additional terminals also provide for an Enable and Teach inputs. Furthermore, the Teach input can also be used to control the polarity (unipolar/bipolar) of the Integral component. An internal jumper allows selection of a voltage or current output. Onboard EEPROM is used to backup and retain the feedback calibration values during a power loss.